It is Wednesday 17th of November 2010, tonight’s tastings are extra special as you can see, and three special guests were invited to attend this grand evenings event. Mr. Robert Heeps a publican and owner of the Canal Inn in Camelon, Falkirk. Mr. Reg Aulds who is a local business man and is also a partner in an Architect’s Practice based in the centre of Glasgow. Mr. Alex Milne a businessman and entrepreneur from Kirkintilloch, on the outskirts of Glasgow. Now that our guests for the evening have arrived Jim and Nicola laid out our tasting table with glasses, water jugs, ice, plain and milk chocolate pieces and some fine mini oatcakes. 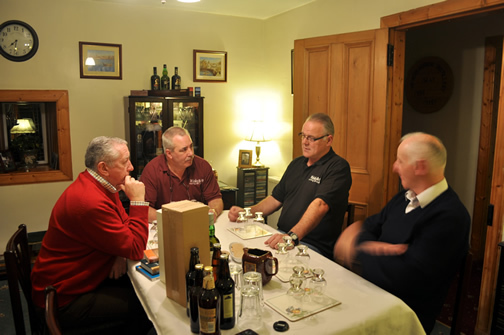 After all the introductions were made we all sat down for the serious business of a fine evening of tasting some fabulous Single Malt Scotch Whiskies. Our first dram of the night was from Glen Moray Distillery in Elgin. Glen Moray Limited Edition Centenary Vintage Speyside Single Malt Scotch Whisky, Finished in Port Wood, 40% Alc/vol, 70cl. This fine Malt was created to celebrate its 100th Anniversay, they used only four casks from the years 1976 through to 1979 and spent the first seven years in ex-bourbon oak casks then re-racked in Port Wood from the Douro valley in Portugal. Nose…Quite a mild nose, honey sweet, you can get the Port coming in. Taste…Very smooth, the honey and Port cannot me missed, a nutty woodiness and a little oily, deliciously complex..
Finish…Medium finish, elegant with gentle notes of oak and a little vanilla drifting in. Nose…Not much here, quite pleasant, a very good start. Taste…Very enjoyable, ultra smooth till the end, Port is strong and this makes a very important mark on this Whisky. Finish…Short and smooth, give me another. Taste…Smooth and succulent absolutely beautiful. Finish…Medium finish, leaves a clean palate with a glow. Finish…Lovely medium finish on the palate. Nose…Slightly sweet but oh so pleasant. Taste…Smooth with some honey and wood. Well our first tasting was great and we all really enjoyed this dram and we also all agreed that it would make a fantastic aperitif. From our previous Glen Moray tastings we the Whisky Boys have no hesitation in recommending any of their expressions for your Whisky cabinet or for an after dinner dram, and as a gift, especially at this time of year, would be ideal. Now lets move on to the second tasting of the evening. The second tasting is extra special and we would ask our readers to go to ” Glenfiddich WOW the Whisky Boys ” and there you can see how special this bottle really is. Glenfiddich 15 Year Old Speyside Single Malt Scotch Whisky, Bottle No. 26, Personally Bottled at the Distillery, 54.8% Alc/vol, 70cl. Nose…Sweet, sweet wine, add a teardrop of water and it opens right up, spice and fruit. Taste…A spicy warmth, complex and still sweet, a touch of dark chocolate, a mature chewable dram. Finish…Long finish, leaving your palate warm and wishing for another,still some chocolate at the back. Nose…Overpowering on the alcohol, wow this is without doubt a big boy. Taste…Hot and spicy, lots of wine and raisins and a hot citrus flavour. Nose…Powerful strong eye watering spirit! What is to follow? Slightly apprehensive.Taste…I need to dilute with a drop of water and an ice cube, result, a fabulous warm and mellow dram. Finish…This is excellent, very mellow and a lovely warmth. Taste…Very complex, many flavours, much better with an ice cube or two. Finish…Staying with me for a long time. Nose…Soft and delicate, a delight. Taste…A warm and smooth special dram, wasted on the angels. Finish…Like a winter evening by the fire, long, warm and lingering. This dram lived up to all it’s expectations one of the best that Jim certainly has tasted. There is still a bit left in the bottle and Jim intends to keep it for himself, and on a snow covered winter evening, sitting in front of his open coal/wood fireplace he will enjoy a long sip of this dram from one of his Edinburgh crystal thistle Whisky glasses, canny wait. This is a special dram to be given only to the best of friends on special occasions and best served as an aperitif. Now for our last tasting of the evening. Nicola, who has tasted this dram before has bailed out of this tasting, all our readers know that Nicola is not a lover of the heavy peaty/smokey Islay drams. Laphroaig Islay Single Malt Scotch Whisky, 10 Years Old, 40% Alc/vol, 70cl. Owners, Beam Global Spirits & Wine. Nose…Seaweed, peat smoke, tar and a barbecue just outside the hospitals main ward. Taste…Big on the palate salty fish from the smokery, intense peat/smoke, only from Islay. Finish…Never ending phenolic sweet, salty, peaty beautifulness. Nose…Soily earth, so much peat that I recoil. Taste…Does nothing for my palate, far too peaty. Finish…Finish is the best bit, this tasting is over,I am not into peaty malts, sorry. Finish…guess what? Very rich and heavy. Taste…Barbecue on the beach, peaty smoke, just wonderful. Finish…A fantastic and enjoyable peaty dram that lasts and lasts. The Islay’s always do that, you either love them or you hate them, as all our readers know Jim actually adores all of them, some Whisky drinkers have to go and persevere with some of the big and heavy Islay drams, you will get to love them as many others do. This dram is certainly an after dinner drink, sitting enjoying the chat of family and friends while the logs crackle in an open fire. A BIG THANKS to our three guest tasters for their time and we hope that they enjoyed Jim and Nicola’s choice of Whiskies for this evening. 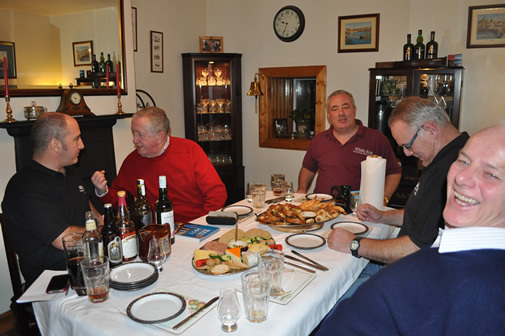 The Whisky Boys had a great night, the chat and the drams were equally great, looking forward to our next tasting.